Breitling Steel Navitimer World GMT A24322. Breitling Steel Navitimer World GMT A24322. Automatic caliber 24 chronometer chronograph movement. 46mm case diameter 15.5mm deep, water resistant to 30 meters. Black dial with slide rule bezel, date display at 3 o’clock position. Third hand for second time zone. Steel bracelet with folding clasp. Box and Papers dated June 2008. SKU: 3018109. 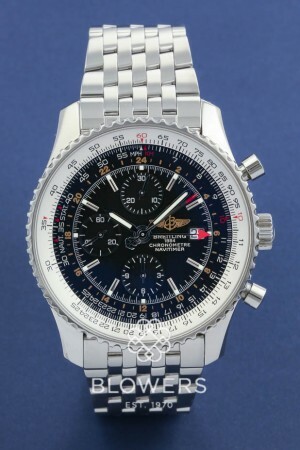 Categories: Breitling, Navitimer.